Pyracantha Cultivation & what to do! Pyracantha is commonly used as a hedging plant, but is also a popular garden shrub which can be trained against a wall which looks fantastic when full of bright berries. Pyracantha can be grown successfully in most soil types with the exception of waterlogged soil. They will grow better in fertile, well drained soil, but will grow well in dry or clay soils, once established. They are best planted in full sun, which helps promote heavy crops of berries but will also grow relatively well in partial shade, but this can cause a lack of berries. 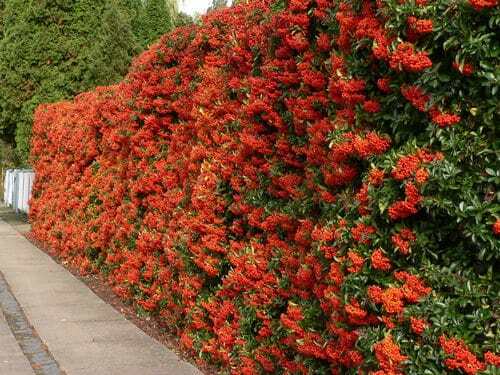 If you’re planting, Pyracantha to be trained against a wall, then ensure you plant them, approximately 30-40cm away from the wall. This helps prevent the plants from drying out, as the soil at the side of a wall is usually, very dry. A perfect example of a Firethorn trained up a wall. 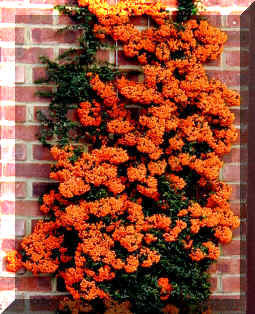 Pyracantha are strong enough to hold their self against a wall, but would benefit from being tied into the wall for extra support. We recommend either running steel wires along your wall and tying the Pyracantha to the wires with strong sting or cable ties. When using cable ties, be very careful, not to tighten them to tight as they can damage the plant and restrict growth. We recommend that you remove the ties every year and replace them with new ties, to prevent them from becoming to tight around the branches. Not keen on steel wires, you can also train a Pyracantha to the wall with wood or plastic trellis before being fastened to the trellis, using string or cable ties. Pyracantha can be planted in full sun or semi shade and grow well in most soil types including clay and dry soil, they will thrive better in fertile well drained soil as this is there ideal growing condition. When planting only plant to the same depth they have been previously planted, never plant further up the stem as this can damage the plant and even kill them. When planting add a small amount of Bonemeal which encourages new root growth and will give them a good start. Pyracantha are ideal for making a garden hedge with as they are evergreen and have large spiky thorns with deters unwanted guest, they form a nice thick hedge and give a mass of berries in Autumn and winter if prunes correctly. If planting for a hedge space plants approximately 30-60cm apart depending in there size and plant in rows. 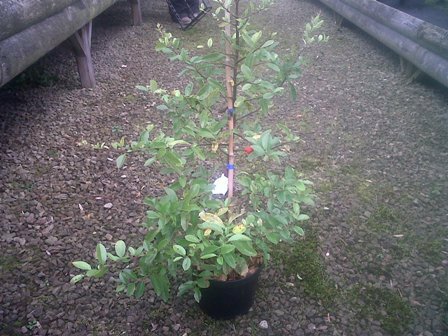 Pyrcantha cutting are easy to take and dont require much care and are taken using semi-hardwood cutting take around 12 months from taking to cutting to getting a good size plant ready for planting out in the garden. The best time to take cutting is something that many gardeners debate but we recommend taking them from late May but they can also be taken right through to October and November. You can place cutting in large deep trays / crates something that is at least 12″ deep, mix half seed compost with half sand and mix together until its throughly mixed together fill the crates with the mixed compost and sand (ensure that the crates used a free draining so that water can escape). This method is ideal for taking many cutting but if you want to take only a few then you would be better putting each cutting into a small pots instead, this also makes transplanting easier and reduces the risk of damaging the cutting when they are rooted and being planted in the ground. The cutting need to be taken from the tips of the Pyracantha branches and should be around 3-6″ long, take your cutting just below below a node (where the leaf joins the stem) and the would needs to be semi-mature wood. Now remove all the bottom leaves just leaving the top ones intact, your cutting is now ready to be planted. Make a small hole in the mix you prepared for planting the cutting in your crate or pot, now dib the end of the pyracanta cutting into some rooting powder which promotes root growth and insert the cutting into the hole and firm around the cutting be carefull not to damage the cutting. Once all your cutting are done you need to give them a good watering and then store them in a place where they will not get direct sunlight but will still get light. You can cover them with clear polytheme or jars to help keepo them hunid and do not allow them to dry out. They will produce roots in around 8-10 weeks but they will not be ready for planting out untill spring.